See examples of the types of transactions departments may include when developing target profiles. 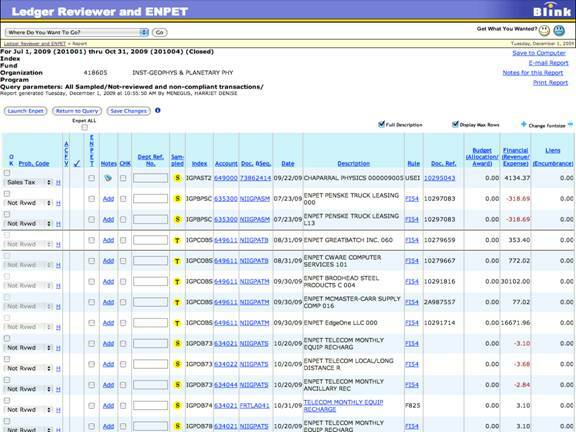 In the transaction sampling process, the Controller's Office has created a global profile, which identifies transactions to be sampled in supplies and expenses, travel, and equipment. These transactions are to be reviewed for all departments. Departments can review additional items by creating their own target profiles. Reviewing 100% of the transactions that occur during the last 90 days of an expiring award, making notes in the Ledger Reviewer and using the ENPET process as appropriate. Express orders, U.S. Bank Who is the cardholder? What is the fund source? Are the internal controls in my department adequate, now that U.S. Bank no longer provides statements? Marketplace purchase Are general supplies, furniture, or water coupons being charged to a federal fund? Bookstore recharge Has equipment been recharged in the past without notifying the business officer? Is equipment being recharged against federal contracts or grants? If so, how can we improve our internal controls? Parking recharges Are parking permits being charged to federal contracts or grants? Are parking permits being charged to sponsored projects? If so, do I need to supply additional justification? Central Garage charges Are shop charges such as body work, claim deductibles, or repairs being charged to federal contracts or grants? If so, what type of internal control is needed to prevent this?